A multitude of electron microscope-based imaging techniques exist to provide unique contrasts in materials. Cathodoluminescence (CL) imaging collects and measures the light generated by an electron beam directed at a material. The fastest and simplest method to obtain CL imaging is by performing intensity mapping. This method records the CL intensity for every beam position using a single-pixel light detector. There are two methods to achieve this: panchromatic and color-filter cathodoluminescence. Panchromatic imaging averages the CL signal over all wavelengths (colors) that fall within the detection range. Color-filtered CL intensity mapping can be performed by introducing a color filter. The SPARC Cathodoluminescence system uses a photomultiplier tube (PMT) light detector in conjunction with a filter wheel. This allows intensity mapping at seven distinct wavelength bands (the 8th entry is empty, allowing panchromatic imaging). The cathodoluminescence emission is directed towards the PMT using a motorized flip mirror. When the flip mirror is engaged it directs the light towards the PMT. When removed from the beam path, the light is allowed to go onwards to other detectors that are used for hyperspectral or angle-resolved CL. The PMT detector is fast, sensitive, and has a large detection area which allows for fast scanning of large sample areas with high resolution. The pixel dwell times can be as low as 1 µs per pixel, enabling video-rate cathodoluminescence imaging. Areas larger than 0.5 × 0.5 mm can be covered in a single scan making it ideal for scanning larger-scale structures or making CL overview images. This is used to identify regions of interest for more in-depth CL studies (e.g. CL spectroscopy). 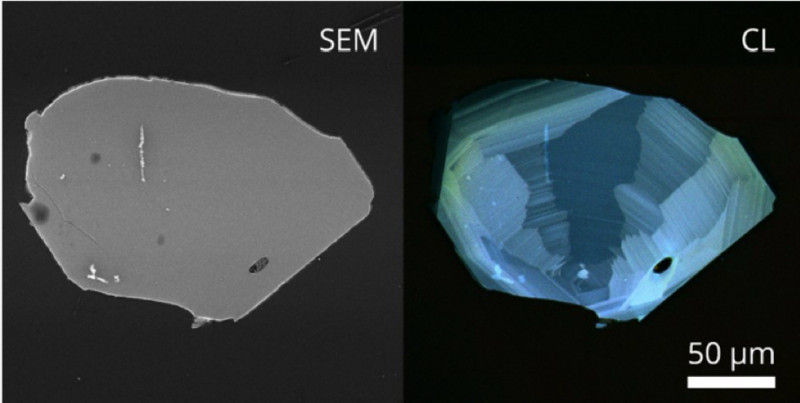 Below is a figure showing a Scanning Electron Microscope image on the left and a Cathodoluminescence measurement on the right. The additional detail on the right was acquired using a PMT and three filters in the blue and green part of the spectrum. These additional details revealed with the CL measurement help in determining details of crystal growth, zonation, defects, and other artifacts of interest.